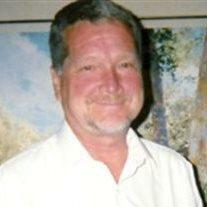 Fred Merrill, born on July 25, 1947 in Springerville, Arizona, passed away on March 27, 2014 in Mesa, Arizona. He was born to Rex Theron Merrill and Elna LaFon Merrill. He was the only boy with three sisters Marlene, Fonda and Brenda. He was married to Brenda Joy Seedall and had six children; Chad, Brady, Amy, Jake, Jenny and Katie. Fred and Brenda are the grandparents of 14 beautiful grandchildren; Presley, Paris, Stella, David Cole, Jake, Ellie, Lyla, Brynlee, Veda, Charlee, Jackson, Thomas, Smith and James. “Freddy” Merrill also known as Pappa loved his grandchildren and they loved to be around him. He would play the guitar and sing to them, they all have wonderful memories of Pappa and will miss him so much. Fred was known for his love of music; he played the guitar and sang to his own children passing this wonderful talent on to them. He was all about family and spending quality time taking vacations and camping trips as much as possible. His father was a real cowboy and passed that heritage along to his son Fred. He had an attitude of extreme optimism up until the day he passed and a strong work ethic. Fred started his career as a mailman like his father and mother early in his marriage while studying at ASU until he spotted an ad in the paper for a job as a car salesman at Berge Ford which sent his life in another direction. His desire for success paid off and he became a legend in the car business always being #1 in sales at Berge for 21 years straight. He later was recruited by Brown and Brown Chevrolet until he retired due to health issues. He achieved “Rockstar” status being recognized everywhere by someone he sold a car to. Fred was also very passionate about food and would not hesitate to expound on every detail about the food. He was a master chef, especially the barbecue. He would frequently host the whole neighborhood to his famous chicken tacos, “Sonoran style” which he learned to make from his frequent trips to Mexico. He was a fisher of the sea, he loved to go fishing whenever possible. We will all miss “ole Freddy” and will always remember the intense love that he showed to friends and family. We love you dad and papa and know we will see you again someday and await one of those monster hugs you so freely gave. Funeral services for Fred Rex Merrill are Friday, April 4, 2014 at 10 AM, preceded by a visitation at 9 AM at the LDS Church at 1911 N. 24th Street, Mesa, AZ 85213.